The TECHT Hush Bolt is designed to improve the overall efficiency, sound signature, and smoothness of operation of the CCM T2 Pump Marker. 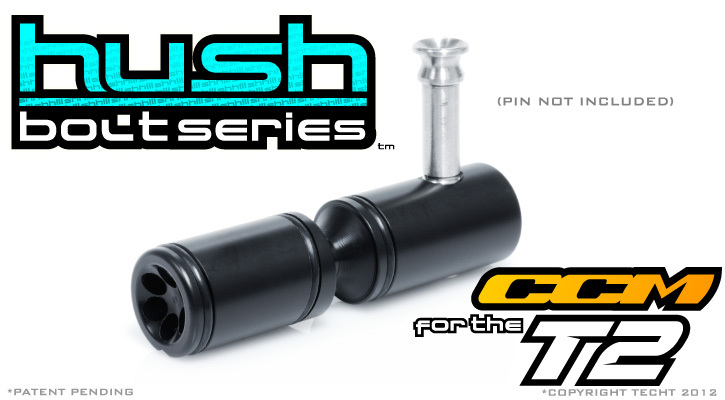 TECHT's Hush Bolt Series for the CCM T2 Pump Marker utilizes our "Even-Flow" venturi face technology. This "Even-Flow" venture face along with our Sweeping Air Diversion Ramp allows the Hush Bolt to obtain optimal efficiency, while quieting the sound signature of the marker. So what makes the Hush Bolt for the CCM T2 different from Stock? Our Hush Bolt for the CCM T2 Pump has been fitted so as to produce the least amount of o-ring drag to keep things smooth, but create enough of a seal to increase air efficiency. This means players can still have a smooth pumping marker without having to sacrifice any efficiency. The hush style face and o-ring placement also aids in knocking down the sound signature of the marker. T2 Hush Bolt for use with the CCM T2 Tournament Pump Marker. Quieter. More Efficient.